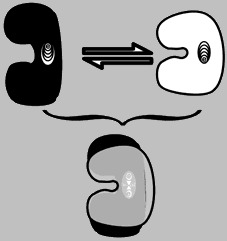 Any of the proteinaceous cylindrical hollow structures that are distributed throughout the cytoplasm of eukaryotic cells, providing structural support and assisting in cellular locomotion and transport. Top: Two states of tubulin in which a single quantum event (electron localization) within a central hydrophobic pocket is coupled to a global protein conformation. Switching between the two states can occur on the order of nannoseconds to picoseconds. Bottom: Tubulin in quantum coherent superposition of both states. 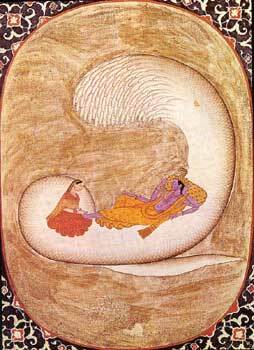 Floating within the cosmic golden egg, the Hindu god Vishnu rests against Ananta, the many-headed serpent of infinite time, before initiating the creation of a new universe in this eighteenth century Indian gouache. According to myth, the universe is constantly created and destroyed; before each successive creation, Visnhu's navel sprouts a lotus flower, from which the god himself emerges in his incarnation as Brahma, source of new life. Brahma breaks open the egg, thus beginning another cycle of rebirth and destruction. The representation of a localized self is derived from a construction path with signal integration by superposition of internal states onto a particle-like structure. This has been described by molecular automaton theory, in particular by the microsite ion channel model (Arhem, 1996). The advantage of a quantum-mechanical system for generation of the self arises from its non- local quality and ability to determine the evolution of a system as a whole (Stapp, 1995). The dilemma is that this system only works non-locally as long as it does not come to a decision by collapse of the wave function or decoherence. Perceptions in our mind, however, are decisions on spatiotemporal states. Accordingly, any representation group of the neuron is strictly classical and local. We will again encounter the previously discussed inconsistency arising from an irreducible mental state, this time described by a coherent quantum-mechanical operation, and its attempted correlation with a reducible neural state. The resolution of this dilemma is attempted by a " fractal approach" to the structure of consciousness. A fractal or self-similar structure contains the construction principle of the whole in each part. Any path mapping the self onto subspaces inevitably entails a correlation to a proportionally downscaled whole. By iterative affine transformation, a fractal construction operates on distinct elements (Dubois, 1997). This renders a fractal local by operation and non- local by representation. A substrate for a fractal structure may be composed of coherent membrane lipid arrays surrounding ion channel proteins. Interestingly, these lipid lattices are affected by ion distribution and undergo extended coherence just in a narrow range around mammalian body temperature. This renders the system resistant to decoherence by heat-invasion (Becker and Rahmann, 1995; Perillo et al., 1994). The fractal model could be a supplementation to the microtubule theory. We may think of a multi-layer or sandwich model for the generation of consciousness: The outer layer is constituted by the neuronal cell membrane and works as "fractal antenna" for ion flux excited by action potentials. The inner layer is composed of a multi-microtubular network underneath the membrane and houses the self. An interface between both layers may be given by an electromagnetic field generated by ion fluctuations. This field modulates the microtubular quantum mechanics and entangles it with coherent lipid arrays in the cell membrane. The multi-layer theory would smoothly integrate field, microsite, and microtubule model.